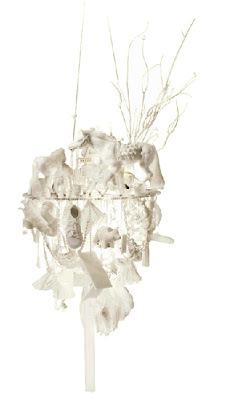 I'm absolutely loving this chandelier by Winnie Liu for Innermost in the UK. I like the intricate detail, and the objects she has chosen to include in her design. 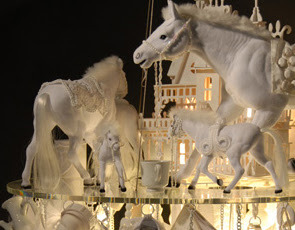 The design is made from unique pieces sourced to create a limited edition of 50 white chandeliers and 50 black chandeliers. Winnie Liu is a jewellery designer turned lighting designer, and I have to say, I love her personal style as well, which is why I included the bottom photograph by Curtis Christophersen. She has a 'magical' mind. Very dreamy. I'd like to see more of her work. Thanks so much for pointing this out, Curtis. I'll be in touch so that we can sort this out to your satisfaction.